Last Train Out Arrives Right On Schedule! 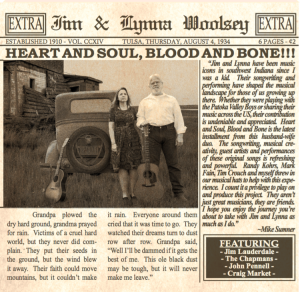 We are pleased to announce that a song Nancy Beaudette co-wrote with Jim and Lynna Woosley will be released on August 4th on their new CD, “Heart and Soul, Blood and Bone”. This exceptional CD is the latest installment from this husband-wife duo. The songwriting, musical creativity, guest artists and performances of these original songs is refreshing and powerful. Jim and Lynna’s 2014 release, “The Road That Brings You Home” garnered top placement on bluegrass, americana and folk radio all across the US and Canada, and “Heart and Soul, Blood and Bone” is destined to have no less impact on the airwaves and in collectors libraries.